Your photo collage in XXL format. Make your favourite photos stand out! I would never have expected that: Ordered on Wednesday evening at 11:42 p.m., on Thursday morning at 08:52 a.m. I got the message that my order was ready for shipment and on Friday morning at 09:00 a.m. the photo was there! The quality was flawless. I will definitely order from this website again. I was actually fascinated by everything they offer. The website has a very clear style, there is a wide variety of collage formats and it was easy to use. Amazing quality, prompt delivery and very uncomplicated. I was looking for a birthday gift for my mother’s 70th birthday. I thought a photo collage on canvas would be best for the occasion. However I was sceptic about the quality of scanned black and white photos. But the collage on canvas looks great, exceptional quality. Customer-friendly service, fast delivery, very good quality and recommendable. To create photo collage is very simple these days. We offer numerous templates on our website to help you make your own collage. We currently have more than 300 collages available. In particular, the collage maker for lots of photos is very popular. It’s easy to make a quick collage with our collage editor since the application provides the user with a wide spectrum of image processing options. 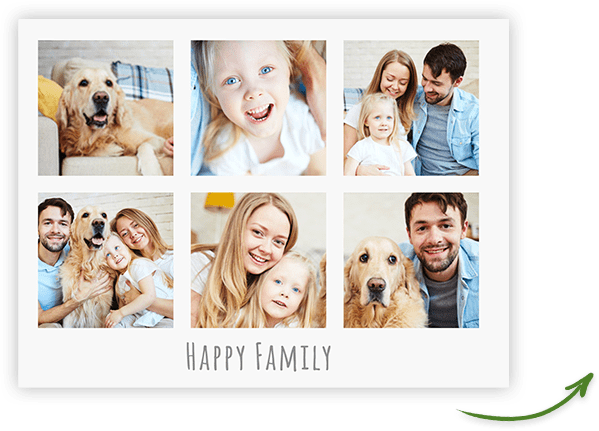 Thanks to these features, it has never been easier to make your own photo collage: Your photo collage is ready in just a few clicks. And some more good news: We offer you a free photo collage. Charges are only incurred if you want to have the collage printed. The most beautiful is the love collage – the love collage as a token of love. 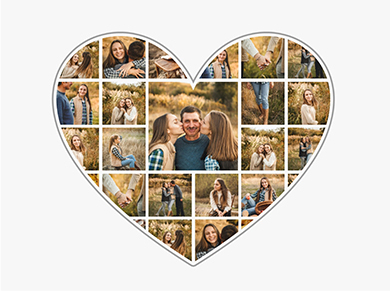 In addition to the many love themed templates, we also offer the heart photo collage that can be filled with your own photos. Also interesting for lovers: In a text collage, you can even add your own personalised message. At the end of the year, the Christmas photo collage is particularly popular. These make the ideal gift at Christmas time. If you want to give even more, you can use our free-of-charge Christmas gift tags. If you want to create something quite unique with your photos, you should take a closer look at the picture collage or browse through our photo collage ideas. Here, you can create one image from up to 1000 photos. 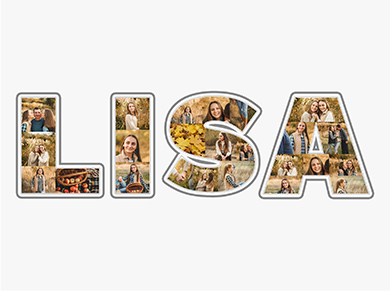 Even more personalized, letter photo collage establish any word, text, symbol or name with photos. A birthday photo collage makes a very popular birthday present. Round birthdays in particular are well-loved occasions for which a photo collage is the perfect gift. 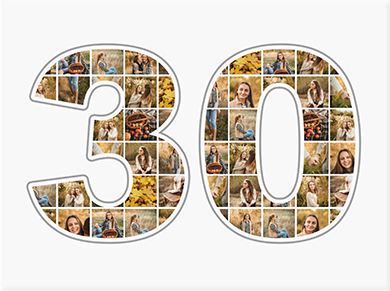 For these occasions we offer a special feature: A personalised number photo collage is possible for every number between 10 and 100. A collage is a little work of art made up of lots of photos. Having spent time diligently putting your collage together, many will now decide to print collage of photos. 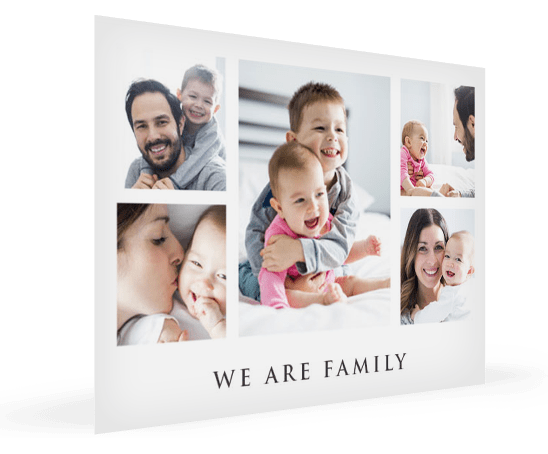 Home printers usually only print small format, so it’s best to simply order the photo collage online. On photo-collage.net, we offer you a cheap photo collage. 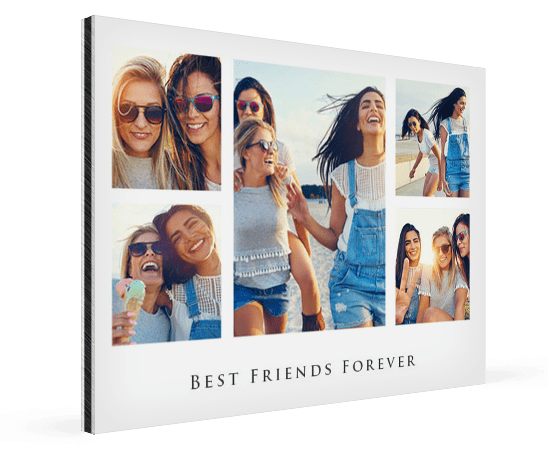 In particular if you want to use the large collage maker, you should note one special rule of thumb: The more photos you use in your collage, the larger you should have it printed. We offer the photo collage on various materials. 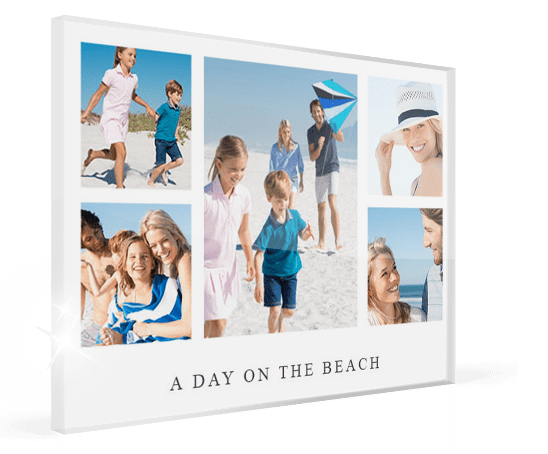 Almost two-thirds of customers choose a collage canvas. The material is high quality yet comes at a cheap price. If your budget is tight, the photo collage poster is an excellent alternative. Those that are select with design, often choose the photo collage on acrylic glass. If the printing result is very important to you, we recommend photo collage on Alu-Dibond. This material is also used by professional photographers. Just a few years ago, you had to buy software if you wanted to use a collage creator. That had considerable disadvantages: The software was expensive for one thing and you couldn’t print out your collage in large format anyway. In addition, the montage maker was rarely updated. Once it was installed on your computer, only those photo grid and collage templates were available that had come with the software. Our modern photo collage app can do much more, however: Once you’ve uploaded the photos, you can still edit them all online. This means that photos can be edited, cropped and coloured after upload. And your collage is put together using the photo collage editor with just a few clicks.